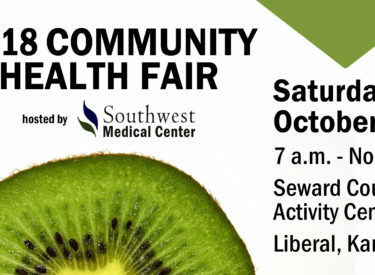 LIBERAL, KS – Southwest Medical Center has announced the 2018 Community Health Fair will take place from 7 a.m. to noon on Saturday, Oct. 6 at the Seward County Activity Center in Liberal. Admission to the event is free. This annual event features a series of lab tests, including a comprehensive metabolic profile, lipid profile, thyroid screen and a complete blood count at a cost of $35 per person. For an additional $7, men can add PSA (prostate specific antigen) testing, which is recommended for men age 40 and older to test for signs of prostate cancer. Women may have a CEA (carcinoembryogenic antigen) screen for an additional $7 to test for certain types of cancer. An HGB A1C (glycated hemoglobin) test is also available for an additional $7 to help monitor long-term glucose control. In addition to these tests, clinical breast exams, prostate exams, spirometry testing, pulse oximetry testing and blood pressure measurements will be offered free of charge at other Southwest Medical Center booths. Free screenings offered by the Lion’s Club mobile screening unit will include visual acuity/vision screens, field of vision tests, blood pressure, blood sugar, and hearing tests. Dr. Mona Rane will also provide free skin cancer exams and the Rotary Club of Liberal will be offering blood glucose screens. More than 50 booths focused on health and wellness will also be on site to provide information about their organization, products, or services, in addition to providing free screenings. Cimarron Veteran & First Responder Services will cover lab test costs for the first 100 veterans and first responders (spouses & dependents not included). Veterans are asked to present their military I.D. Veterans interested in testing may contact Chris Hickman at (620) 417-1679 for questions about eligibility. Several businesses and organizations, including The Community Bank, National Beef, ARSI, The Midland Group, Southern Office Supply, and Southwest Medical Center, have contributed to this community event so far to assist in keeping screening costs low for all participants, regardless of their insurance status. Admission to the Community Health Fair is free for the general public and no pre-registration is required for lab tests or screenings. All visitors interested in having the above lab tests done at the health fair should plan to fast for at least eight hours prior to testing. Concessions will be provided on-site at the Activity Center with proceeds benefiting the Seward County United Way. For more information about attending the 2018 Community Health Fair, please contact Keeley Moree at (620) 629-6335 or Rachel Downing at (620) 629-6424. Event updates are available on the Southwest Medical Center Facebook page.